A unique Oriental restaurant right in the heart of the new Charter Quay development in Kingston. 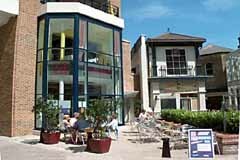 Within easy walking distance of the town centre, the restaurant is situated on the banks of the Hogsmill creek which flows into the River Thames. Located on two floors the restaurant offers two different dining experiences. The ground floor dining room, named the Meinton Room, with its comfortable sun-trap terrace, is styled after the traditional noodle bar with long tables for communal dining. The Meinton Room serves a mouth-watering selection of 14 different styles of noodle but you can also eat from the main menu with a range of stir fries, curries and salads. All food is cooked to order and serious consideration is given to healthy, wholesome eating as only vegetable oil is used for cooking. With the choice of the more casual downstairs eating area or the upstairs more formal dining area, Cammasan is the ideal choice for parties, celebrations, family get-togethers and business functions. The upstairs restaurant in particular is an excellent venue for business meetings, product launches and other formal business functions. The upstairs restaurant, the Chaitan Room, is elegantly decorated and provides a panoramic view over the river. The menu offers a whole new experience in enjoying Oriental food with a selection of Thai, Malaysian and Chinese dishes. Choose to eat just a simple meal or something very special such as Spicy Chiu Yim Lobster. After your meal relax over your coffee and desserts in the very comfortable lounge area. Open every day 12.noon-11.30pm. Free delivery from 6-10.45pm (orders over &#65533;15). All major credit cards accepted (not Diners). 10% service charge in the Chaitan and Meiton Room. Prices subject to change without prior notice.